A Russian couple has been arrested in Kuala Lumpur for child endangerment after video clips were shared online showing a man swinging an infant around as part of a street performance, according to state media Bernama. The tourist couple, aged 27 and 28, were arrested in the Malaysian capital at around 3.30 p.m., Monday, in the tourist area of Bukit Bintang, while allegedly repeating the performance while attempting to solicit donations. Members of the public had alerted the authorities to the suspected child abuse. 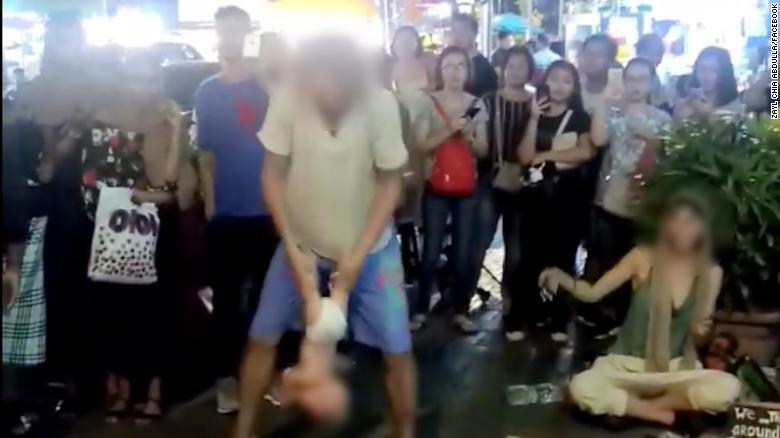 Video of the initial performance shows a man holding the diaper-clad four-month-old infant by its legs, swinging the child through his legs and above his head, while other tourists sit nearby, chanting and playing instruments. The Russian group played instruments and chanted while one member swung the infant around repeatedly. A small crowd gathered to witness the event, with some recording it on cellphone cameras. Zayl Chia Abdulla, a Facebook user who posted a video of the performance, wrote: “I (happened) to pass by this area in Bukit Bintang and I saw this irresponsible act that can literally cause injury to that poor baby. The performance appears to have been inspired by the controversial Russian practice of baby dynamics yoga, or baby swinging yoga, which has been featured on Russian channel Russia Today.